Any smart people with less investment can earn millions of Dollars while starting garment buying agency. Although many peoples are interested to set up a buying house in our Bangladesh, they can’t set up or run a buying due to a proper knowledge of organogram, functional activities and proper documentation house in a very professional way. But, the garments business in Bangladesh is offered an essential role by the garments buying a house. And it’s an honor to say that Bangladesh is the second largest readymade garments exporting country in the world. But, as most of the buyer coming from the foreign country, directly production monitoring, quality assurance, price competitiveness is not possible to handle for the buyer. Apart from these, garments buying house plays the role for the buyer of monitoring the garments quality, productivity, competitive cost, shipment, and others. As most of the time foreign buyers do not want to contact directly with garment factories, they like buying a house to procure the garments products for them in manufacturing different garments factory in Bangladesh. Among 7000 Bangladeshi garment factories, there are nearly 2,500 small and all of them are working 100% export oriented readymade garments sector. In this sector has around 1,000 buying agents those who are working as a garment buying house. According to Export Promotion Bureau data, there has generated $28.09 billion exports in the fiscal year 2015-16, which was a 10.21% growth from the previous year. Among the amount, there are the knitwear contributed $13.35 billion and woven products $14.74 billion respectively. Apart from these, sufficient backward linkage industries have been made for these industries trims & accessories in recent days. As the garment buying agency is a challenging job, there has a cluster of talent, enthusiastic and energetic workforce. However, buying houses are nothing but group work like merchandising, quality assurance, and technical team. Sourcing of materials, providing approval to suppliers, sample development from supplier factories and maintained liaison within buyers and suppliers are the responsibilities of the merchandising department. Aside from these, it also calculates effective cost consumption of products for competitive clothing market. 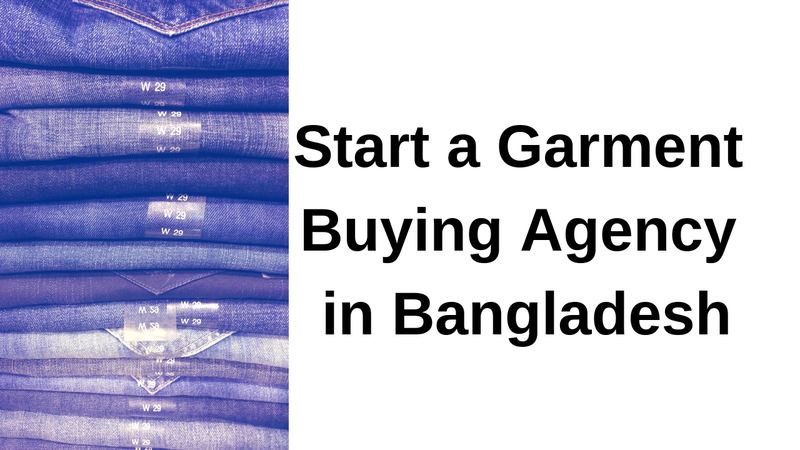 Let’s know about the steps that are essential while starting a garment buying agency in Bangladesh. It’s very essential to perform research while writing a business plan and the plan must be based on the research. Therefore, think including more information about how you envision your business. What’s more, make a mission statement defining your business goals in it. In addition, a detailed description of your business should be included in the plan. Apart from these, you’ll need to divide your time between production, marketing, and customer service for a garment buying agency. Since production can be done in off hours, marketing and customer service should be done in regular business hours. Plus, don’t forget to collect and attach the documents at the end of your business plan are necessary to form your business. Although initially, you don’t need a big office, you can start your business with a 3-4 room office. This is because it’s essential to prove your existence in the business and a communication address. Another crucial step is that you should set a product development facility include designers, a sampling room and showroom so that you can display your products and developments. In this department, you have to develop your product range or product profile with your creative team that can attract your buyers. You need a team that will consist with merchants, technical department, and Quality Assurance personal while you’re starting a garment buying agency in Bangladesh. And your designer will get help from the Technical team to develop products and sampling. On the other hand, your buyers and suppliers are to be communicated by the merchants. Also, keep considering the quality aspect of samples and production. In the garment buying agency business, it’s essential to develop supplier base either in your region or low-cost clusters. As a result, you have to make a big list of the suppliers. When you’re in a garment buying agency, you’ll find there are many small buyers look for sample development facility. You have a chance to do this job for foreign buyers in this sector. Also, you don’t need to set up a sampling room if you want to do this service. Simply go for samples are made by your suppliers, from where you are going to procure the order for buyer’s samples like FIT and SMS (salesman sample) instead of developing yourselves. Also, your supplier would not disagree with the sampling and they will provide you with production orders. Although suppliers would not charge you for a small number of samples, you can charge for those samples from buyers.